Well. At long last, after all these years, it's finally here. This one's been in the works for what seems like forever (it was originally scheduled for Spring 2010 release), but the wait is finally over. Nancy and Sluggo are the sine qua non of comics archetypes. As rendered by the inimitable (though many have tried!) Ernie Bushmiller, they have entertained, mesmerized and fascinated generations of comics readers, from the most humble of lonely lunchers to the most erudite of intellectual aficionados. Nancy collapses the cultural divide in a work that is a multiverse unto itself, existing simultaneously on as many planes as there are perspectives; in the process rendering meaningless much of what purportedly distinguishes "high" and "low" art. Nancy by Ernie Bushmiller is an essential achievement in American art. 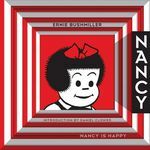 Nancy Is Happy is published by Fantagraphics Books and is the first of a series of volumes that will cover at least the years 1938 through 1961 (more may follow, depending on the success of the these volumes and the solvency of Fantagraphics at the conclusion of their publication). It is a hefty, square-formatted, flexi-cover volume which is yet another design triumph by Jacob Covey and offers up three full years – 1943, 1944 & 1945 – of Nancy dailies. Daniel Clowes provides a perfect start to the volume (and the series as a whole) with his witty and perceptive foreword, one that will – together with the following information packed introduction by "the editors" that provides background and historical context – put readers in an enhanced state of expectancy: after all these years, alone together with Nancy at last! Can't wait? Get started now with this 20-page PDF preview.